Who does not fight for truth and for the good belongs to the “enemy camp” and not the “City of God”. Dear friends of the faith. Any time you hear or see the phrase, Restoration, or the like, denies divine revelation that the first AntiChrist was Paul VI and that the final solution can only be the Second Coming of Christ. Do not trust Traditionalists who preach or indicate, ‘restoration,’ ‘Sedeprivationists,’ ‘material formula popes,’ ‘interregnum,’ ‘a future Pope,’ etc, on these subjects. You notice that I use a capitol C on AntiChrist, which means he has to be a priest, or acting priest. They are all denying Scriptures. St. Bernard voiced his opinion that the AntiChrist would have to be a false pope. Not an Anti-Pope. An Anti-Pope can still be Catholic. An AntiChrist has to be an apostate. Fellow Catholics. Since the legalization of the Vatican II Council the Fathers have had over 43 years to come to an objective conclusion. As it stands to this day the Fathers are as deeply divided over the following facts as they were 43 years ago. The Most Reverend Blaise S. Kurz, O.F.M., D.D., LL.D. SHORT HISTORY OF THE FRANCISCAN ORDER. 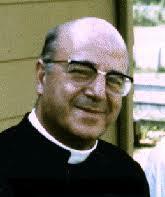 Archbishop Lefebver’s letter to the future Bishop written, 12 June 1988. To: Frs. Williamson, Tissier de Mallcrais, Fellay, de Gallareia.